Three words to sum up Alan Turing? Humour. He had an impish, irreverent and infectious sense of humour. Courage. Isolation. He loved to work alone. Reading his scientific papers, it is almost as though the rest of the world — the busy community of human minds working away on the same or related problems — simply did not exist. Turing was determined to do it his way. Three more words? A patriot. Unconventional — he was uncompromisingly unconventional, and he didn’t much care what other people thought about his unusual methods. A genius. Turing’s brilliant mind was sparsely furnished, though. He was a Spartan in all things, inner and outer, and had no time for pleasing décor, soft furnishings, superfluous embellishment, or unnecessary words. To him what mattered was the truth. Everything else was mere froth. He succeeded where a better furnished, wordier, more ornate mind might have failed. Alan Turing changed the world. What would it have been like to meet him? Turing was tallish (5 feet 10 inches) and broadly built. He looked strong and fit. You might have mistaken his age, as he always seemed younger than he was. He was good looking, but strange. If you came across him at a party you would notice him all right. In fact you might turn round and say “Who on earth is that?” It wasn’t just his shabby clothes or dirty fingernails. It was the whole package. Part of it was the unusual noise he made. This has often been described as a stammer, but it wasn’t. It was his way of preventing people from interrupting him, while he thought out what he was trying to say. Ah – Ah – Ah – Ah – Ah. He did it loudly. If you crossed the room to talk to him, you’d probably find him gauche and rather reserved. He was decidedly lah-di-dah, but the reserve wasn’t standoffishness. He was a man of few words, shy. Polite small talk did not come easily to him. He might if you were lucky smile engagingly, his blue eyes twinkling, and come out with something quirky that would make you laugh. If conversation developed you’d probably find him vivid and funny. He might ask you, in his rather high-pitched voice, whether you think a computer could ever enjoy strawberries and cream, or could make you fall in love with it. Or he might ask if you can say why a face is reversed left to right in a mirror but not top to bottom. Once you got to know him Turing was fun — cheerful, lively, stimulating, comic, brimming with boyish enthusiasm. His raucous crow-like laugh pealed out boisterously. But he was also a loner. “Turing was always by himself,” said codebreaker Jerry Roberts: “He didn’t seem to talk to people a lot, although with his own circle he was sociable enough.” Like everyone else Turing craved affection and company, but he never seemed to quite fit in anywhere. He was bothered by his own social strangeness — although, like his hair, it was a force of nature he could do little about. Occasionally he could be very rude. If he thought that someone wasn’t listening to him with sufficient attention he would simply walk away. Turing was the sort of man who, usually unintentionally, ruffled people’s feathers — especially pompous people, people in authority, and scientific poseurs. He was moody too. His assistant at the National Physical Laboratory, Jim Wilkinson, recalled with amusement that there were days when it was best just to keep out of Turing’s way. Beneath the cranky, craggy, irreverent exterior there was an unworldly innocence though, as well as sensitivity and modesty. Turing died at the age of only 41. His ideas lived on, however, and at the turn of the millennium Time magazine listed him among the twentieth century’s 100 greatest minds, alongside the Wright brothers, Albert Einstein, DNA busters Crick and Watson, and the discoverer of penicillin, Alexander Fleming. Turing’s achievements during his short life were legion. Best known as the man who broke some of Germany’s most secret codes during the war of 1939-45, Turing was also the father of the modern computer. Today, all who click, tap or touch to open are familiar with the impact of his ideas. To Turing we owe the brilliant innovation of storing applications, and all the other programs necessary for computers to do our bidding, inside the computer’s memory, ready to be opened when we wish. We take for granted that we use the same slab of hardware to shop, manage our finances, type our memoirs, play our favourite music and videos, and send instant messages across the street or around the world. Like many great ideas this one now seems as obvious as the wheel and the arch, but with this single invention — the stored-program universal computer — Turing changed the way we live. His universal machine caught on like wildfire; today personal computer sales hover around the million a day mark. In less than four decades, Turing’s ideas transported us from an era where ‘computer’ was the term for a human clerk who did the sums in the back office of an insurance company or science lab, into a world where many young people have never known life without the Internet. Headline image credit: A four rotor Enigma machine. Photo by Greg Goebel. Public domain via Wikimedia Commons. B. Jack Copeland is the Director of the Turing Archive for the History of Computing, and author of Turing: Pioneer of the Information Age, Alan Turing’s Electronic Brain, and Colossus. He is the editor of The Essential Turing. Read the new revelations about Turing’s death after Copeland’s investigation into the inquest. Visit the Turing hub on the Oxford University Press UK website for the latest news in theCentenary year. Read our previous posts on Alan Turing including: “Maurice Wilkes on Alan Turing” by Peter J. Bentley, “Turing : the irruption of Materialism into thought” by Paul Cockshott, “Alan Turing’s Cryptographic Legacy” by Keith M. Martin, and “Turing’s Grand Unification” by Cristopher Moore and Stephan Mertens, “Computers as authors and the Turing Test” by Kees van Deemter, and "Alan Turing, Code-Breaker" by Jack Copeland. For more information about Turing’s codebreaking work, and to view digital facsimiles of declassified wartime ‘Ultra’ documents, visit The Turing Archive for the History of Computing. 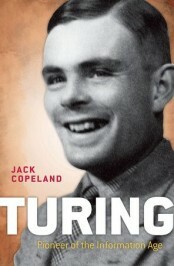 There is also an extensive photo gallery of Turing and his war at www.the-turing-web-book.com. Doesn’t a claim that Turing was “the father of the modern computer” suggest that the people who built the first modern computers a.) knew about Turing’s work, and b.) were dependent upon it in their building? Surely the first is true only for some of them, and the second for none? Zuse and Atanasoff may have known of Turing as being one of many people whose thinking about logic was important, but this does not make him in any way their guide. Eckert, Maunchly and Bush would certainly have met or known of Turing as a member of the British microwave tube liaison group, but again this is not evidence of his “father”ing their work. It used to be the duty of editors to stop writers from spreading silly exaggerations. They can only lessen, never polish, the reputation of the person being incorrectly lauded.